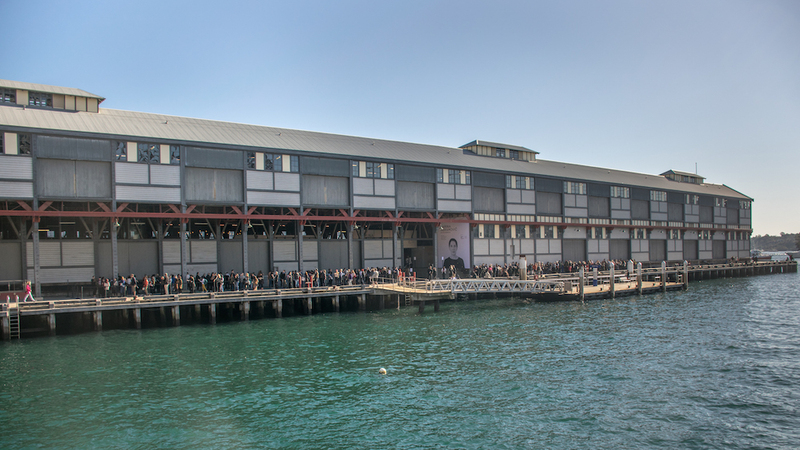 Pier 2 at Walsh Bay Sydney has been the venue for Marina Abramovic’s residence program for the past 12 days. It is the 30th Kaldor public art project which invited the public to be participants in Abramovic's conceived performance pieces. I first learned of Abramovic’s art practice after watching the 2012 documentary ‘Marina Abramovic- The Artist is Present’. It was a revelation to me, as I was someone who did not quite understand concepts behind most Performance Art. Nor did I have an interest in becoming aqauinted with it. Performance Art always seemed a little out of my depth and understanding. Sometimes I’d react quite negatively to it and dismiss it altogether as being too cerebral or elitist. But art’s influence to open up and broaden our experience of the world and of ourselves should not exclude practices deemed out of our depth, uncomfortable or confronting. All the more reason to dive in with an open mind and willing heart. Marina Abramovic is a Serbian performance artist living in New York since the 1970’s. She was awarded the Golden Lion for Best Artist at the 1997 Venice Biennale, and listed as one of Time Magazine’s 100 most influential people of 2014. So when my friend Flic asked me if I’d like to join her on the last day of the Abramovic residency program, I thought it could be a once in a lifetime opportunity. I waited in line with hundreds of people alongside the historic finger wharf proximate to the Sydney harbour Bridge, eager but a little apprehensive, to be honest, about what I was signing up for. After depositing all belongings, including my phone into a locker, we were ushered into a ‘warm up’ area with video screens taking you through exercises to loosen you up. It amazed me already how compliant people of all ages became to instruction no matter how silly the exercises seemed to be. From here, you were given noise cancelling headphones and moved on to the main area of the building. Volunteers approached and silently took you by the hand to one of the performance areas. My first experience consisted of me standing on an elevated box with 20 or so other people motionless, eyes closed in silence. It struck me how urgently I wanted to know the rules. How long do I stand here? Can I open my eyes? Will someone lead me back off the plinth? Our world is mostly governed by habit and the need to follow rules. Clearly, my discomfort of not knowing the rules was something I’d need to get over to remain open to this experience. I remained motionless, allowing the mind to settle down and after 5 minutes or so, I slowly moved off the box to witness those that had been standing around me. exercise is what Marina Abramovic has become most notable for -'The Artist is Present'- a 736-hour static, silent piece, in which she sat immobile in the museum’s atrium while spectators were invited to take turns sitting opposite her in 2010 from March to May at the Museum of Modern Art (MOMA) in New York. When I sat opposite a young woman of about 19yrs, it was obvious to her immediately of my discomfort. Gazing silently into a complete strangers eyes is extremely confronting. My mind was racing with all kinds of projections. My face flushed with blood in the discomfort and there was a compelling need to avert my eyes. But I remained fixed. I estimate that I sat with her for about 25 minutes. Our performance exercise was interrupted by the fact that Marina Abramovic herself brushed past us to sit in the chair immediately to my right. In the performance art world, she is bit of a superstar, so to say my concentration was disrupted is bit of an understatement. I wanted to look and found myself questioning the need to idolise and get caught up in the celebrity of the moment. I remained still and fixed in gaze to the young woman opposite me. like a small child with a blanket. I stared at the ceiling of the wharf at the sunlight refracting from the harbour through glass windows near the roof. The play of colour along wooden beams was enough to quieten down a racing mind. I lay motionless for about 10 minutes allowing the strangeness of a room filled with people in silence become less foreign. to this pace alongside a crowd in unison was strangely hypnotic. A noticeable contrast to the bustle of crowds heading towards the venue an hour before. I left the exhibition space in a glow and with a changed attitude toward a genre of arts that had once bewildered me. I felt connected in a city that mostly conspires to have you feel disconnected.